CADD Manager Home>Whatever>Blog article:How Cuil are you? 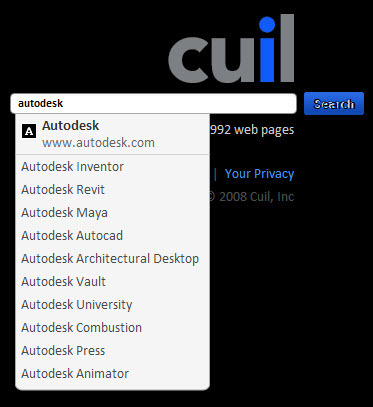 A new search engine has appeared on the landscape… It is Cuil. Cuil was developed by a few Google “formers” who left the fold, got some investors and went it alone. It is interesting on the surface but not real flashy. So – I typed in “CADD Manager” and came up as #1 on the list. Using that search term on Google provided the same results. So I typed in “CAD Manager” and came up as #3 on Google, but no where in site on Cuil. I do like the autocomplete “suggestion” function. You can turn it off and on under preferences… as well as safe search. One thing I do like is the Next Page funtion at the bottom of the screen. It stays in one place. I don’t have to scroll to get the buttons. Take a look for yourself and try some of your typical searches.